Kisses came to live with us in late June. My husband and I knew from the first evening of visiting her at her foster home that we were right for each other. 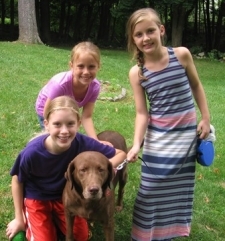 A 7 year old chocolate Lab, she’s so easy going and undemanding, the perfect dog for an all too indolent older couple. We take easy strolls around the neighborhood, now extending to the woodland trails nearby, perfect for all of us. She’s wild about the women in the family — does her semi-hysterical greeting to our adult daughters as well as to me, should I have to leave her even for half an hour. She loves our granddaughters too, and is gentle and friendly even with the youngest, who, sadly, is terrified of dogs, but is coming along nicely through playing with Kisses. Meanwhile Kisses is filling out, her coat has improved, her health is excellent, and she is astonishingly well-behaved. Thanks, Peppertree, for finding us this wonderful companion.